Online college program is becoming more widely available. Education program is one of popular college programs and here we compare colleges ranked in the top 10 online graduate education program by US News Department. St. John's University at NY takes the first place. Auburn and South Dakota State University place second and third. In contrast overall college ranking and popular program such as business and engineering, public schools are more included than private schools in the top 10 list. 7 public schools are ranked in the top 10. 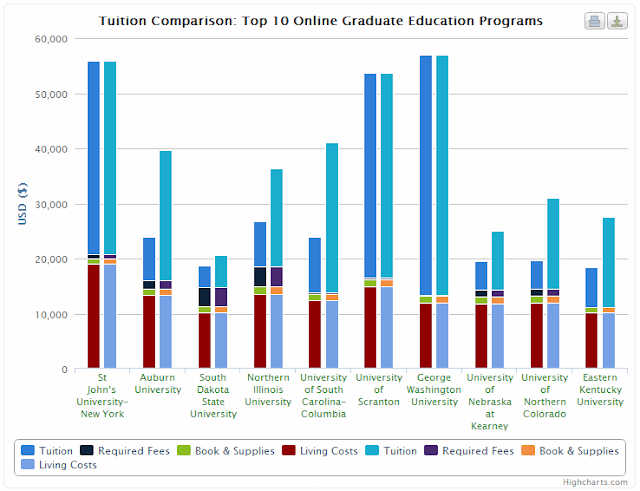 Next Table shows tuition,fees, and living costs for the top 10 colleges. The chart provides the intuitive comparison of the tuition and costs. You can see full comparison including admission, graduation, and more factors between the schools at Top 10 Online Graduate Education Program Comparison and Methodology for ranking at US News Methodology for graduate education program.